Our annual Christmas puzzle is available now. As in prior years, the reward for solving is a video Christmas card, but you'll need to figure out the password by solving the puzzle first. Note: If you need some help, the full answer is posted here, but try solving it without help first... it's more fun that way. That was a lot of fun - thank you! It looks as if your cat does the same thing that mine does, I recognized the fabric in July as something one of my boys like, and one of my daughters has the same birthday month/year as one of yours. It was nice to "meet" your family! --Margaret G.
Yes, I enjoyed your family's year, Blaine! Your son and my daughter both graduated from college in 2015. It made May extra fun. . . Thanks for another year of blogging fun, Blaine. All the best to your family! Thank you, Blaine. Now how do you always find time for the blog also? Those were "great days." Well done. Blaine, Thank you for all you do to host and moderate this blog. Glad you had plenty time for family fun as well. And to all Blainiacs, May 2016's challenges be filled with fun! A [password] puzzle, quite 11. Thanks for hosting a blog that 6 to the needs of this group. Blaine, just caught your video. Loved it. I especially loved the half US/half UK cake. 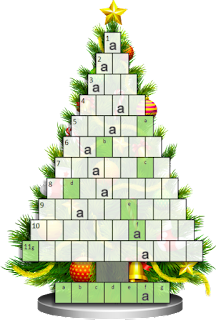 Great Christmas tree puzzle too. Almost didn't get the last answer. Nice family you have. Y'all sure did a lot of cool stuff this past year. Certainly an enviable year you have had. Thanks for all you do! Both of us were celebrating our 50th birthdays this year too, so my wife thought it would be fun to make a cake that was split "50-50" for each of us. Get it? You are the best Blaine! Thanks for hosting such a wonderful blog and sharing your family adventures with us! Happy holidays and best wishes for the upcoming year! Late to this party, but I second all the comments above. Blaine, you (and Felicia?) are truly masters of media! And, your family seems even more fun that this blog! Thank you for another year of letting us play on your playground.